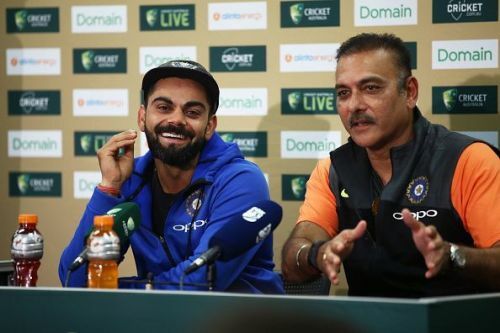 Having guided India to a historic 2-1 Test series triumph in Australia, head coach Ravi Shastri was at his blistering best in the press conference at the end of the Sydney Test. The 56-year old revelled at the moment and went on to term the triumph as bigger than the country's game-changing victory in the 1983 World Cup. At the press conference organised in the aftermath of the drawn Sydney Test, Shastri described the emotions prevailing in the dressing room following India's maiden Test series victory on Australian soil. Shastri claimed, "I will tell you how satisfying it is for me. World Cup 1983, World Championship of Cricket 1985 this is as big, or even bigger because it is in the truest (Test) format of the game. It's Test cricket, which is meant to be the toughest." Having toured Australia eleven times for Test series, this was the first instance of India emerging triumphant since they began travelling down under in 1947/48. However, the head coach did not like to get caught up in history. Shastri insisted, "Past is history, future is a mystery. We have won today after 71 years and I'd like to live in the present. And salute my captain for being the captain of the team that beat Australia for the first time in Australia in a series." After losing a hard-fought series in South Africa and then going down fighting to England, India finally emerged on the victorious side in Australia. For Shastri, the triumph was the culmination of all the hard work done over the last twelve months. The former commentator affirmed "This tour didn't start in Australia. This tour started 12 months ago in South Africa, where we said there's a certain brand of cricket that we are going to play, we will experiment with combinations, find out what suits the team the best and take it forward from there." He added, "We learnt a lot in South Africa and we learnt a lot in England. We made mistakes, which we didn't make in this series. We learnt from those mistakes and fired it home properly. So the most satisfying part of this was it was a team that was working over those last 12 months." Although they began the series with a euphoric 31-run victory at Adelaide, India slipped badly on a fiery pitch at Perth. On a surface offering sharp bounce, they played four pacers and saw off-spinner Nathan Lyon win the game for Australia. The defeat, as well as team strategy, attracted sharp criticism from eminent former cricketer such as Sunil Gavaskar. India hit back at their critics by cruising to a 137-run triumph at Melbourne. Riding on Cheteshwar Pujara's defiant batting and a collective effort from their bowlers, the visitors managed to surge to an unassailable 2-1 lead which they would eventually hold on to with a draw in the rain-hit Sydney Test. Shastri asserted, "I said in Melbourne - I think I mentioned people taking pot shots and firing blanks. I wasn't joking there, because I knew how hard this team had worked. When you fire from there, by the time it crosses the southern hemisphere, it's blown away by the wind like a tracer bullet." In his unique nonchalant demeanour, the erstwhile all-rounder elaborated, "But lead, with something in it, can be pretty serious. And that's what we have fired right through the series against Australia. We were committed, and it jolly well bloody made a difference at the end of it all. This is not a team of gods or demigods, seniors or juniors." Upon sealing their maiden Test series victory in Australia, India have an opportunity to create another slice of history when the 3-match ODI series begins at Sydney on January 12. The Men in Blue have a chance to register their maiden bilateral ODI series triumph on Australian soil.